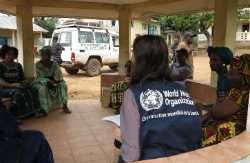 WHO works with partners in Ebola affected areas to mobilize the community on the disease’s risks and protective measures. The declaration followed the advice of the Emergency Committee that met on 6-7 August and that unanimously decided that the conditions for a PHEIC were met. These refer to the following considerations. The Ebola outbreak in West Africa constitutes an “extraordinary event” and a public health risk to other States. The Director-General endorsed the Committee’s advice and issued them as Temporary Recommendations under IHR (2005) to reduce the international spread of Ebola, effective 8 August 2014. The Emergency Committee will reassess the situation within 3 months. The current EVD outbreak began in Guinea in December 2013. This outbreak now involves transmission in Guinea, Liberia, Nigeria, and Sierra Leone. As of 6 August 2014, countries have reported 1 779 cases (1 134 confirmed, 452 probable, 193 suspect), including 961 deaths. This is currently the largest Ebola outbreak ever recorded. In response to the outbreak, a number of unaffected countries have made a range of travel related advice or recommendations. There should be no general ban on international travel or trade. Restrictions outlined in the recommendations regarding the travel of EVD cases and contacts should be implemented. States should provide travellers to Ebola affected and at-risk areas with relevant information on risks, measures to minimize those risks, and advice for managing potential exposure. States should be prepared to detect, investigate, and manage Ebola cases. This should include assured access to a qualified diagnostic laboratory for EVD and, where appropriate, the capacity to manage travellers from known Ebola-infected areas arriving at international airports or major land crossing points with unexplained febrile illness. The general public should be provided with accurate and relevant information on the Ebola outbreak and measures to reduce the risk of exposure. States should be prepared to facilitate the evacuation and repatriation of nationals (e.g. health workers) who have been exposed to Ebola.